In Part- 5 of “how to build an eCommerce business”, we focused on how to achieve SEO (Search Engine Optimization) rankings for your eCommerce business. SEO, being the latest craze in the world of eCommerce helps to track your website progress however, top rankings are not always the only reason to earn profits and ROI. There are many other SEO metrics that should be considered apart from keyword ranking to measure the performance of an online marketing strategy. Today, we have come up with the most important SEO metrics that matters, when it comes to create a profitable SEO campaign. Inbound Links- Links coming to your site from other sites is the biggest determinant of your SEO ranking. The quality, quantity and productivity of inbound links are therefore important metrics to track. It is not just the number of back links that matters to search engines; it is the number of links from quality high page ranking websites that search engines are interested in. From SEO point of view, obtaining quality and relevant backlinks should be your most important priority. These are used to increase the visibility of your website, link popularity and page ranking. Conversions from Organic Traffic- The most important factor for the success of any eCommerce website is higher number of conversions. Once you have achieved online visibility, the next step is to make sure that visitors coming to your site are converting. Inbound Web Traffic- The primary objective of SEO is to increase traffic from search results. Although traffic alone cannot determine the optimization success; measurement of it is a key factor. So, prior to embarking on an optimization project, make sure you have shortlisted specific and long-tailed keyword phrases as well as short -tailed keyword phrases draw in more traffic. These metrics need to be taken into consideration. Organic Visits Per Page- Every targeted keyword should have targeted page on your site for drawing traffic for those terms. One of the most important objective of SEO is to increase the volume of traffic to your website from search engine via organic search results. Overall organic traffic increased can be used as an effective metric to measure the performance of an optimization campaign. Bounce Rate- Bounce rate is a metric that shows how engaging a website is. SEO bounce rate could be a very effective metric for determining the value of a web page. Most webmasters strive to get their rate as low as possible because high rates suggests that your site isnt’ offering a lot of information related to product/service you are offering. Therefore, people are leaving your site without visiting more than one page. Indexation Metrics- Indexing is an important factor, when it comes to achieve presence in natural search results. Indexation metrics help you determine if all of your web pages have been correctly identified by search engines. This is done by measuring your site indexation through queries in major search engines. After you have determined the number of queries, match it with the number of pages that should appear and you have your indexation metrics. 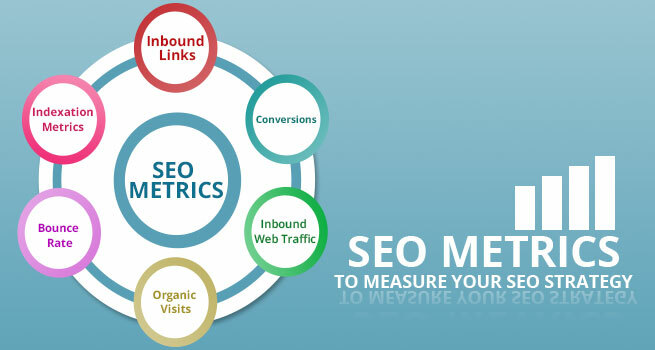 So, keep following the above mentioned SEO metrics to gauze the success of your search engine optimization initiatives. Till the time you practice these, we will be coming up with next series of this blog that tells how can you analyze your SEO metrics using Google Analytics and Webmasters Code. Keep reading to know more and more. We will be back soon.